Kingsoft Internet Security 9 Plus is a comprehensive security solution which has been designed to protect computer from viruses, Trojans, worms and other unwanted threats. The security solution has been packed with Kingsoft AntiVirus, Kingsoft Personal Firewall and Kingsoft AntiSpyware for providing strong layer protection of files, safekeeping private information, and ensuring a safe and secure Internet experience. 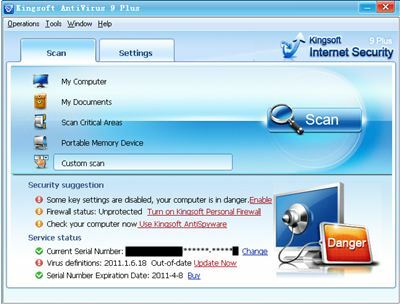 Antivirus – scans viruses, Trojans and other unwanted threats. Firewall – protect PC against attacks from the Internet or via a local area network. Antispyware – detect and remove spyware, adware threats and other kinds of computer parasites from the system. Cloud Security Technology – mainly composed of the mercury platform, reptile system, and trusted Internet authentication which is used to store various virus samples and enhances protection for system. Malicious website blocking – able to block access requests when an unknown program attempts to access a Web address and analyzes the security of this address by using the Web address authentication functionality. Trusted Authentication Technology – a service that decides the security status of software applications, and provides security authentication services by collecting and analyzing numerous new samples. MSN Encryption – provides Instant Messenger protection in the Embedded Scan section, protecting MSN users dialogues, monitoring file transmission processes and scans for any potential viruses. Supports most of the Windows operating systems such as Windows 2000 Professional, Windows XP Professional (32 bit), Windows XP Home (32 bit), Windows Vista (32 bit) and Windows 7. Uncompressed the kis.rar and double click on the DUBA100926_DOWN_ENU_330920_0.exe to execute the installation.